Emily and Tommy are the loveliest people. In a funny coincidence, I actually went to highschool with Emily and she reconnected with me while looking for a wedding photographer. When she introduced me to Tommy, and their fun, down-to-earth relationship, I knew we were a great fit. 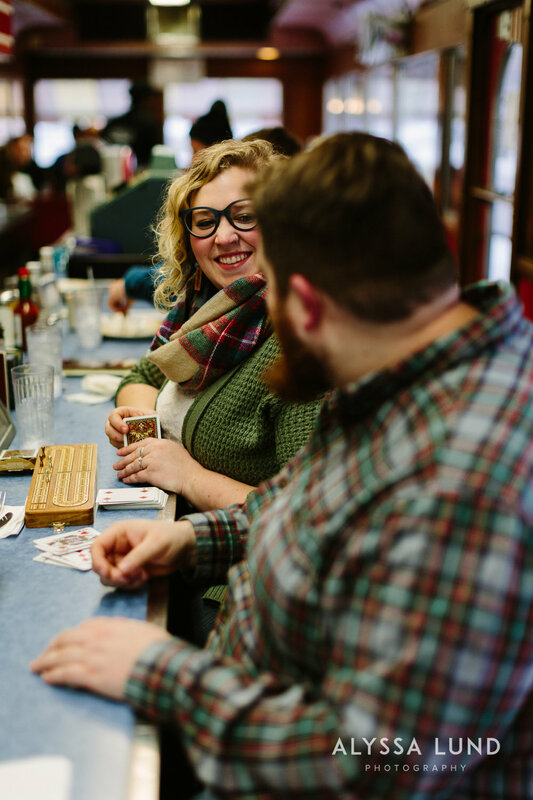 Emily and Tommy were pretty nervous about being photographed so, for their engagement session, we designed a lifestyle vibe that documented a real afternoon in their lives. Being nervous and feeling awkward in front of the camera is such a common thing! One of the reasons I love planning an engagement session is that it gives you and your partner the chance to get used to being photographed, and know that it’s not scary - I do the work to keep it relaxed and fun. The advantage of a lifestyle session is that you’re already doing things that are familiar and comfy and I’m along to take photos. You already know how to walk down your favorite block, or sit in your favorite diner, it feels intuitive and less like you’re posing. 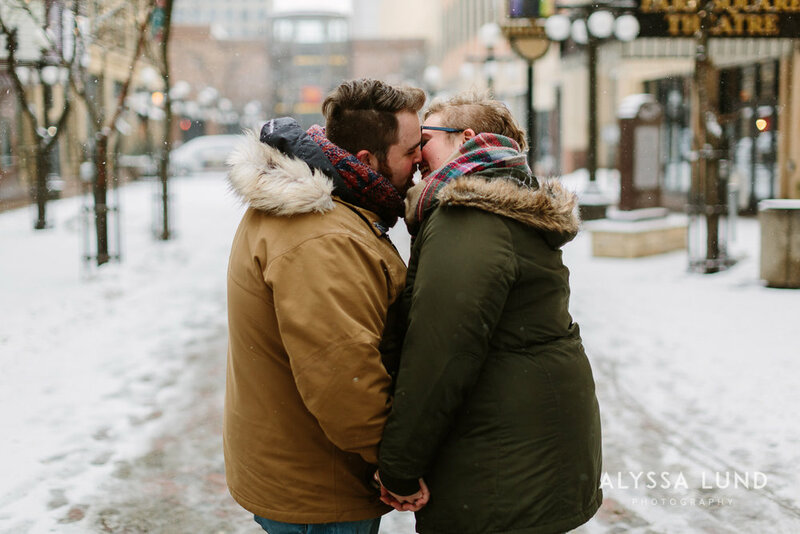 For Emily and Tommy, they wanted to celebrate their life in St. Paul and some of their very favorite things to do as a couple so we planned a session that captured iconic locations and incorporated Emily and Tommy’s love of their local music scene. On a very cold day in February we met up in a picturesque little square in St. Paul and walked toward the Palace Theatre (passing the beautiful Landmark Center on the way.) We chose to keep to the route Emily and Tommy would take if they were on a regular date, walking from dinner to a concert and I loved hearing about all their memories and stories of the shows they remembered most. 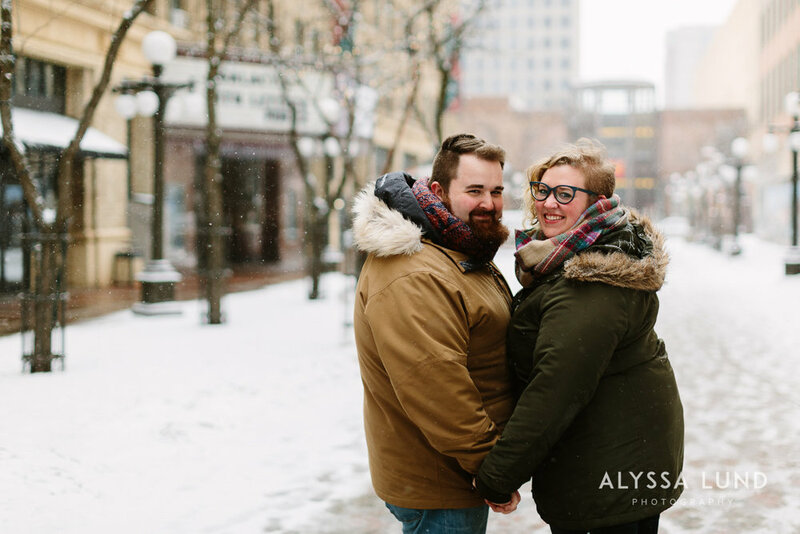 We paused in the little alley by the Palace Theatre to take photos and they ended up being my, and the couple’s, favorites of the session. Sometimes people think cloudy or snowy days are bad for photos - nothing could be further from the truth. In these portraits, the sky is overcast, teeny flakes of snow were falling into drifts on the street and everything is reflecting light! Cloudy days create this lovely, even light that flatters faces and makes eyes especially bright. After a few sweet photos by the Palace Theatre, we headed to the iconic Mickey’s Diner to warm up and get pancakes. 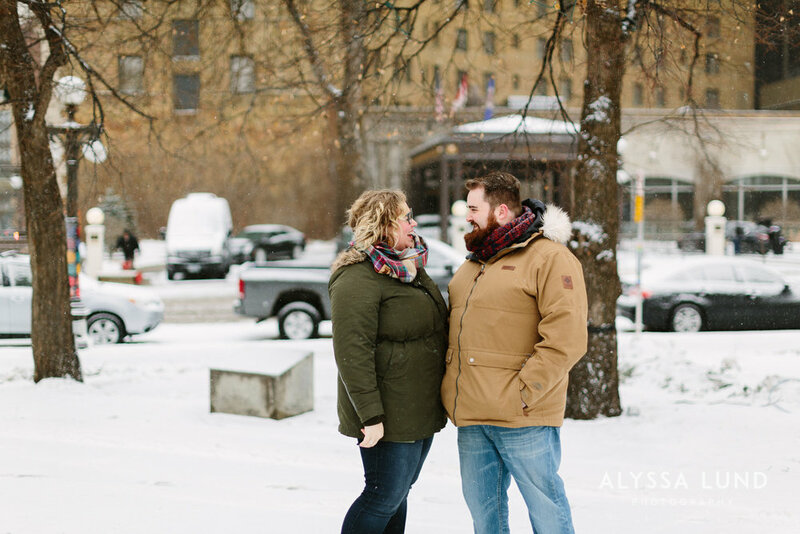 A great tip for winter engagement sessions in Minnesota is to make sure you have some inside locations planned! It gives you a chance to defrost a bit and stay comfortable, trust me when I say it’s really hard to be cute and romantic if you’re freezing! 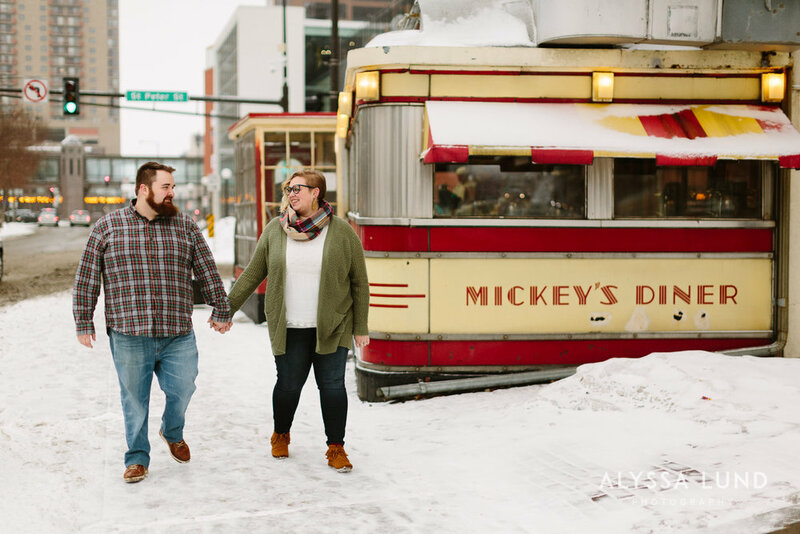 Mickey’s is also a special place for Emily and Tommy; Tommy grew up in St. Paul and went to Mickey’s regularly as a kid and now it’s a regular casual date for he and Emily. How much do you love that they brought along cribbage?! We ended the day walking along the river in St. Paul and it was such a lovely way to close out a perfect date! Emily and Tommy, thank you for sharing your favorite parts of St. Paul and so many great music recommendations with me! I cannot wait to celebrate your wedding with you in the Fall.